How do you see the point of a memory board? Why keep one? Do you keep one? Or will you? I wanted to say I'm skipping this because it's an unfamiliar phrase. It makes me think of keyboard or motherboard, computer terms which any sane right-brain writer avoids knowing more than superficially. My "board" is the (paper) daytimer on my desk. It reminds me, alerts me, tells me everything. As long as I remembered to write things down in the first place. I tried Google calendar but kept forgetting to look at it. So I have to coordinate this daytimer with a portable pocket diary and believe me, that's enough challenge. Ever have those days when the two are out of synch and you miss a meeting/ appointment/ class/ webinar because of it? The diagram that Julie drew was likely discussed in a Google Hangout that I was not attending. However, you can see that it literally draws connections on a chosen topic, much like collective verbal brainstorming. You are triggering personal memories in a visual way. As I was not in the discussion, I'd better stick to the above suggestions. So no, I don't have a tangible board or fridge reminders. I'd likely ignore them. After all, I go to the fridge with a preoccupied mind, blindly seeking food. My desk is the nerve centre. Sometimes food considerately appears on my desk by itself with no recall of a trip to the kitchen. Really, this should happen more often. Do you have a favourite colour? and if so why? Do you like vibrant colours or darker colours? Do you associate anyone with a particular colour? If so who and why ? Does your favourite colour reflect your personality? This topic is only difficult in that I don't have one all-time favourite colour. 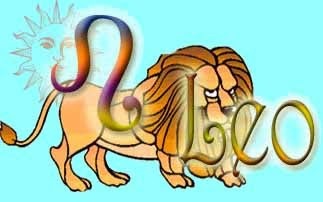 My inner Leo makes me go for bold. RED is racy and glorious. PURPLE is powerful and comforting (but it has to be a blue-purple, not a red-purple). TEAL is therapeutic and rich. And so on. When I was young and not in charge of selecting my own clothing, I was told that redheads can't wear red (a colour clash too horrific for ordinary eyes). Guess what I did as soon as I had spending money? Now that I am grown up and mature, BLACK and GRAY have a way of filling my wardrobe. Go figure. Love comes in varying shapes and sizes; I love my (insert your family member, pet etc); there is no right or wrong way to love....or is there? Define what love means to you. OMG, Julie (The Book of Me creator) this was a sneaky one. Let's shamelessly skip it, I said to self. Lazy shirk, self said back to me. Some bloggers made lists of people and things they love, that make them happy. Waxing sentimental and lyrical is not in my tool box today. Having said that, how can I then say I simply love life without sounding like a vacant beauty pageant contestant? Just about everything in the whole concept of life? Sure, I don't like mean people and liars and corrupt politicians and incurable diseases and rice pudding and rap music and stop right there. Wrong way to start a memory board of love! Love can have disappointments like George Clooney and Richard Branson not answering my emails, but on the whole it makes the world go way 'round better than its opposite. The crux of the matter is not failing to voice love for the people and events that keep me uplifted! "Prompt 23 — Memory Board," The Book of Me, 1 February 2014, Anglers Rest (http://anglersrest.blogspot.ca/search/label/The%20Book%20of%20Me : accessed 23 February 2014). Further clarification and appropriate credit: The "folklore" and the "narratives" I have been following are the online work of Urmas Haud, Estonian astronomer and genealogist. His profession explains the initial confusion with the Tartu Observatory website. I've no idea why I had such difficulty finding the root site other than general technical ineptitude. However, the website is huge and navigation is not the easiest. There is more to be explored. The following is basically a memorial to the folk tradition, drawn on the written story of one family's formation and expansion. As the Riis clan grew in quite long isolation from the outside world, it also coincided with the development of two of Estonia's forest villages; the family and the villages are inseparable. Hans "Riis" is my alleged sixth great-grandfather. His wife is named Kai on the Geni family trees but her name does not appear in the online narrative. Hans had three sons; each of them had many sons. The narrative has no dates associated with Hans' sons: Peet, Jan, and Tonis. Two of them chose separate parts of their grandfather Tiit's lands on which to live. I'm working on spotting all the location names, which were mostly on the large Vastemöise estate ― an estate that existed from the Livonian Order period. The aristocratic Von Stryk family was the landowner in the 1700s; as of yet I have found nothing more about them. The Geni trees give Peet's dates as ca.1727-9 June1783. "Hantsu eldest son Peet gone up along the edge of the river and made a house. Thus emerged Oolmiku farm." That description is about the clearest of all farm names mentioned. "River" probably refers to Raudna. A son of "Oolmiku Peet" married a woman from Oolmiku village, a place named after her mother (or her maternal family?). It appears that Peet's descendants were associated with Oolmiku, aka Hoolmiku, farm until at least the early twentieth century. Middle son Tonis seems to have stayed at his father's location, Adutuaa? on the Sillavilla? probably still near Sandra village. He was known for maintaining his father's (and grandfather's) lifestyle of admirable clothing and horses. Two of Tonis's sons founded farms called Aadujaani and Sõõru. Youngest son Jan aka Jan Tõramaa (ca.1725-12 January 1800: year of birth precedes elder brothers?) is deemed the direct ancestor. He "come to the creek and the forest has a house here ... So could be Abaja farm ... inherited from his father-spirit and pride." The nominal "Tõremaa" and variations (e.g. Teramane, etc) seem to indicate his location and there is a village of that name now. Riisa "Hall" (or something similar) would appear to be the name for his home. Perhaps "the creek," is connected to the Raudna river. More interesting garble from the story: "He received a full Tõramaa lust ...". Seems he had some dispute with older brother Peet, perhaps resulting in one ousting the other from somewhere. But "Tõramaa will come back, and it started to work well. Father, Father's fortunes remember wearing boots and spurs sincerely loved riding horses." Regarding Jan's location, one Geni tree has a slight variation: Jan "... come Tõramaa creek forest and made it into the house. Only the house was a place for the stream section of land was treeless, otherwise all the fat Laan. Both were born Teramane (Abaja) farm." An explanation of "isolation from the outside world" is necessary. The lands occupied by Tiit Kolgis and his descendants is a very large, once heavily wooded, marshy area. Clearly it had discouraged much settlement before Tiit's time. 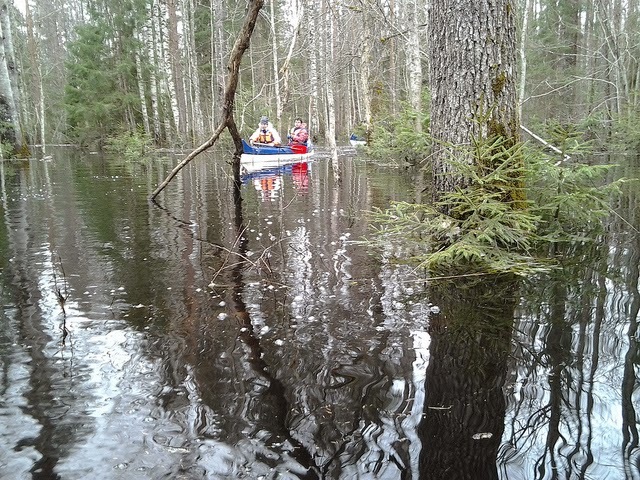 The entire area of Riis habitation for generations is now part of Soomaa National Park ("Estonia's Wilderness Capital"), dedicated to protection of its special ecological environment. Wilderness is a significant word. More on this in the next installment — lengthy searches have finally produced a very relevant map. Our Jan had two sons including the direct ancestor Andres Riis (ca.1764-21 November 1843). Andres' year of birth is up in the air. The Geni trees show his precise date of death, most probably from a written record, occurring at age 79, hence the calculation back to 1764. On the other hand, one researcher adds, "According to the Book of the Church was born in 1756." From what I can gather, Andres was not much of a farmer. He always planted his rye early and never had a good harvest. One year a son argued strongly with him about the appropriate planting time, so each did their own thing on different parts of the land. The son proved a bountiful rye crop while Andres failed again. His father was suitably impressed and said to him, ""Sow, son - I can see that my work is not in it." One wonders at the ability to cultivate in a difficult environment for almost three hundred years! It's not clear (again) but the farm seems to have been Jan's Tõremaa. Andres' other son Tiit apparently went further off to an "island marsh dwelling." Further information continues regarding the sons of sons; other farms in the vicinity associated with them were Üleoja and Riisa Kangru. But the translation gets even rougher. It is Andres' daughter Liso Riis (10 February 1794 - ??) who is my great-great-great-grandmother. My stumbling explorations have been interesting ― the appeal seems obvious (out of the swamps we came?) — but still incomplete even from Haud's website alone, and subject to translation errors. How useful is all this? We shall see ... Part Five has a helpful map! "Hobby," Urmas Haud, (http://www.aai.ee/~urmas/ : accessed January-February 2014). Begging the question here. Home ― now or then? My parents' home or my domestic-era home? My current home? Must wing it, then. In olden days the start of school holidays was when the train from Winnipeg pulled into the Port Arthur station, signalling I was home. The heart would feel almost like bursting from happiness. Back in God's country. That's what we called it. The feeling never abated. Home was our century farm where they grew up. Horses, ponies, cattle, pigs, sheep, chickens, pheasants, peacocks, turkeys, capons, guinea fowl, rabbits, have I forgotten anything? Oh yes, assorted dogs and cats. Summer corn roasts; winter Christmas-tree cutting parties; the MerriMar maple syrup business; 4-H for ponies and sheep; Prince Phillip Games; trucks; tractors; hay baling; rock picking; boyfriends; drivers' licences. Well, they could tell you much more than I. Now, home is my writing cave of desirable, mostly splendid solitude. Well-deserved rest as I see it. Substituting Lake Ontario for Lake Superior, I'm good. Growing up, ballet school was not exactly a hobby, it was five days a week of hard work after school. No time left for hobbies, I was clearly a social misfit. Maybe school was a hobby. Although I dabbled with writing poetry, drawing cartoons, collecting LPs, and inventing pranks to harass teachers. Late insertion: Cripes, how could I forget. Sewing. Something good inherited from my grandmother and mother. Never thought of it as a hobby, though. It was thoroughly satisfying craftsmanship, creating half my kids' clothes and some of my own for years. I miss that old sewing machine, especially when I need curtains or to alter ill-chosen fashion mistakes! Genealogy became a hobby, then a lifesaving job. Currently could we call camels a hobby? Could be going full-circle to social misfittedness. Growing up, my father had a routine. Breakfast at 8, lunch at noon, dinner at 6. I'm guessing that was pretty much my mother's routine by default! We kids just fell in line. Now I eat at noon and about 9 pm. Okay, confessing to popcorn/junk food break (cue furtive chortle). That comes close to nailing it. Thank you, free-floating Facebook sources and Genevieve Rhode wherever you are. Boarding school ingrains two morning things: You make your bed, you get dressed. Or vice-versa. You do it at once, every day. Without fail. Like the army. You don't even have to think when you are putting on the same uniform each morning. Excellent training to become an obsessive-compulsive. Nowadays, a little variation is required. 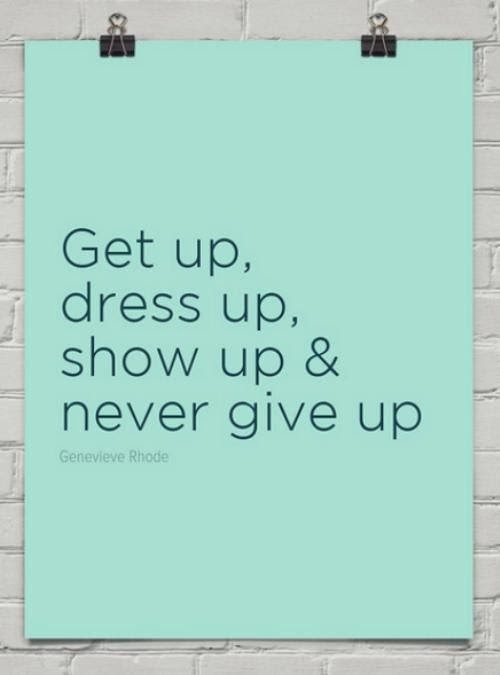 Getting up is about the same, maybe with a few extra groans. Getting dressed requires coffee for stability on the hind legs and to facilitate decision-making about what exactly to wear. Unless, of course, that was compulsively decided the night before to avoid heavy thinking first thing. Like if you never throw out the clothes from twenty years ago, there are wardrobe choices to debate and slow you down (should do something about that to increase efficiencies). More coffee is required before the bed gets made. Scrolling Facebook is like a tune-up to test how many neurons are blinking. Then to work. Or fitness class, if the daytimer says so. Ah well, structure and discipline are necessary but routines are a rather dull topic. Mine starts disintegrating after the daily walk in a futile attempt to blow off the brain fog. Looking with interest at the FitBit trend. I will say I never leave home without the earrings in. I'm not dressed unless. Part One and Part Two introduced "Tiit Kolgis" (born ca.1650). Clarification: my ultimate source for his legend is a website built on Estonian folk tales, collected by Jaan Kuldkepp, popularly referred to as the Kuldkepp Chronicles and published online by a presumed descendant. Ries could mean "freeze" if Tiit had perhaps actually been from Dutch Friesland [Frisia/Fryslân]. That last sounds a little lame to me ― it's so dependent on correlating pronunciation among different languages. It seems possible to me that a "knight" called "Swedish" could have been drawn from any part of northern Europe claiming allegiance to the the Swedish king at that time, such as a German state or Friesland, i.e. a knight who knew where his bread was buttered. The word "Rice" also appears as a surname, apparently as a freaky pronunciation match by the translation software. Hants or Hans flourished like his father "but without his sword and spurs." It was apparently Hans who lived through, and was most affected by, the twenty-year Great Northern War when the invading Russians caused a great deal of destruction. The peasants often fled into the forests to hide. There's considerable detail, albeit garbled, about how the enemy "extortioners" sought to ambush Hans along the river, but he outwitted them. The great house built by his father was all but destroyed in the war; it's said that only the "Tõnistua" room survived ― another one of those problematic words. The small red box on this map indicates the specific area of interest within Estonia. The search is still on for a better-scale map with (hopefully) village names. Hans, already dubbed the "rich man," survived and eventually the village was reconstructed. Hans himself is said to have rebuilt elsewhere on the lands inherited from his father Tiit. He started a new farm that may have been called Aadutua. The Sillavalla River is mentioned. He had three sons which coincides with what is told about the 1690 tax list, assuming only the children are shown on it as per the available transcript. Hmmm ... if anyone is following this sketchiness, we have to wonder where is "Evert"? Evert ― accepted by all the Geni trees as the son of Tiit and our direct ancestor. The story says after the war Hans "have been looking for a decent place and set up everting (Aadutua?) Farm. "[sic, but emphasis added] It was very unclear to me whether the word "everting" referred to a place name (to our eyes it looks like a verb or adjective) and if this is the source for a person called Evert. The original Estonian: "Hants tulnud Sandralt Sillavalla jõge mööda allapoole Halliste alamjooksule, otsinud sündsa koha ja asutanud Everti (Aadutua?) talu." Note the capital E on "Everti." The context suggests a farm name. Maybe I do need a competent translator. Like now! The proliferation of capitalized words and other nouns throughout the account is a bit dazing, and they are not showing up on the usual search engines, understandable if they are obsolete farm and place names. Also, you see how a name's endings can alter, depending on grammatical placement. The alleged son Evert (Eiwertil is an alternate name used in Geni) was spotted in 1690 on an estate tax list. Evert's household had, and again I quote a translated source: "two adults (older than 15 years) sons and two daughters and one son, a minor." Could the name on the tax list refer to a farm name rather than the head of the family? It might make more sense if this was Hans, living on the Evert or Aadutua farm. Three sons are attributed to Hans, not to Tiit. Since the Geni trees have inserted Evert as the son of Tiit and father of Hans, is it possible they have conflated "Evert" and Hans? Although they give ca.1670 as Evert's birth year, and ca.1705 for that of Hans, the latter hardly squares with Hans being an adult and community leader during the Great Northern War (1700-1721). Well, it's not only the translations that make me skeptical! Disclaimer (again): This is a different kind of research exercise, obviously not a truly genealogical project. At this stage, I seem to be little more than out-guessing the translations. The story goes to grandchildren of Hans and gets more specific, but thus becomes exponentially more difficult to follow the translations. Undaunted, more to follow. Yours truly is so old-fashioned I still think chess is the coolest game. But the first game I remember playing is checkers; my Dad was the instructor/opponent for both. The games arrived as gifts from Santa. In elementary school we were obsessed with playing marbles, but we called them "allies." It was a matter of taking turns to shoot your allie along the ground toward a "pot," that is, a hole you scooped out of the dirt. Any number of kids could play. The eventual winner ― and it quite escapes me now how the system worked ― got to keep all the allies in the pot. Everyone vied to collect the prettiest coloured marbles that we lugged back and forth to school in a cloth whisky-bottle bag with a drawstring. 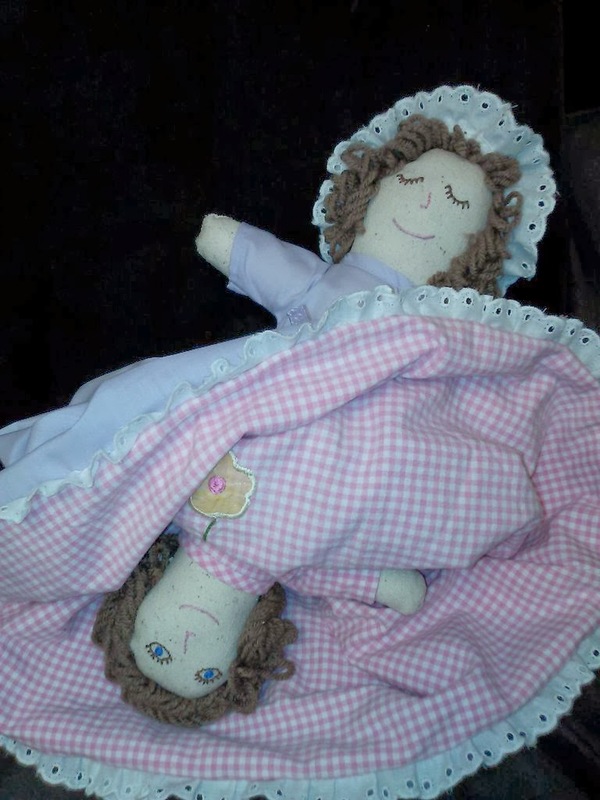 The unique dolls my Grandma Freibergs made ... how I wish I still had them! Or even a photograph! She made them all of one piece in sturdy cotton, stuffed them, and embroidered the faces. Then, and that's where her seamstress training shone, she crafted a gorgeous dress with a long skirt. The brilliant part was when you turned the doll upside down, a completely new doll appeared in a different full length gown, different hair, different face. I, of course, thought Grandma invented them. A little research educates me otherwise (another win-win for The Book of Me). They are called "topsy-turvy dolls" and their history goes back to plantation days in America ― not to Grandma's Latvian roots. The original doll babies had a white face and a black face. There's an interesting discussion on Historical Folk Toys http://www.historicalfolktoys.com/catcont/4716.html. In the early twentieth century, commercial companies began selling popular patterns so handy homemakers could make their own. Can you remember it? Who bought it for you? Do you still have it? FAIL here in the memory department. Maybe the first gift was the silver christening mug? ... now gathering dust in one of my descendants' cupboards (instead of in mine). Or the quilt Grandma made for my crib. The patches alternated in pink and blue, a clear sign no-one knew in advance which one I'd be. I think I still have it, if only I knew where to look. The same Grandma created tiny baby dresses with incredibly detailed stitching. They became very fragile over the ensuing years; lack of proper care was a factor. 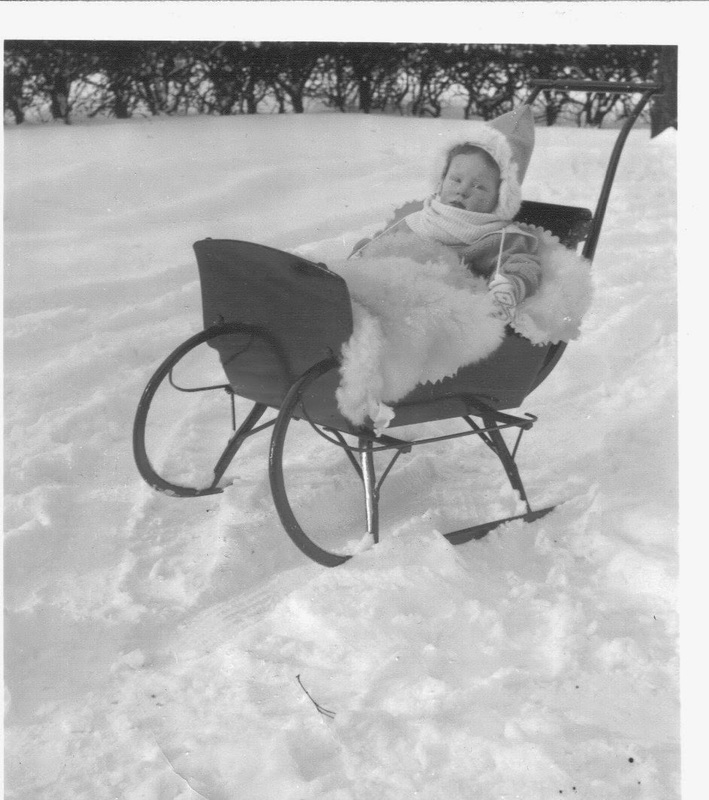 Then there was the handsome red sleigh my Grandpa Dougall made. Was it for me or for my father and his sisters before me? Lovingly crafted and ideal for all that previously-tolerated northern SNOW. It now resides with my niece in Quebec where they also have a winter abundance of SNOW and a few babies to enjoy it. People who live elsewhere that we will not see over the festive season, people that have passed away; who do you miss? Why? "Elsewhere" ... nearly all the important people in my life live elsewhere. Foremost I miss my children at odd times ― meaning actually any old time ― because they are all so far away. That means I am ever grateful for the likes of Email, Skype, and Facebook. And the technology helps me understand they are no longer the helpless toddlers I cherished or the fractious teenagers I despaired over. I miss my long distance friends scattered on diverse pathways to global corners, some from way-back-when. Some intersect electronically on a fairly regular basis; others, regrettably, have gone by the wayside. If I were to list them all and why I miss each not being 'round the corner to visit, I would still be writing this two years from now. Maybe sometimes they miss me too. Much sadder is the fact that friends of childhood and later have died. Did they fulfill some of their dreams? Memories of times we shared always warm me. 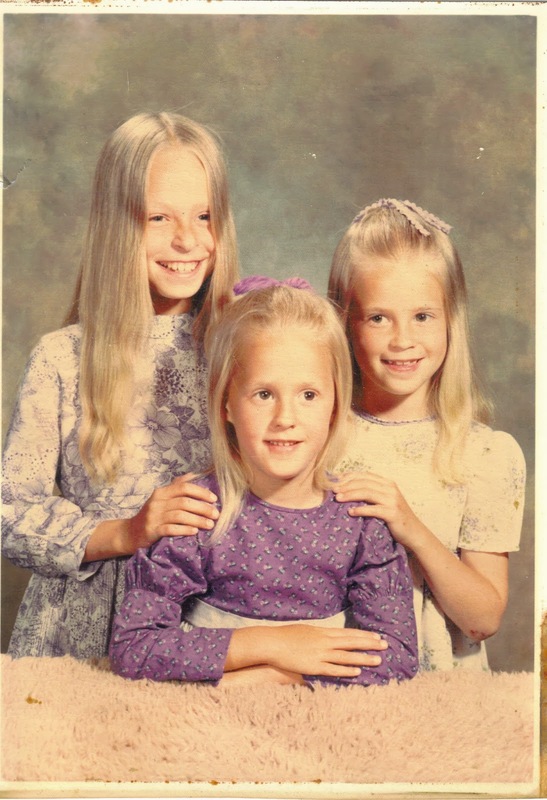 A special loss are those who went far too young ― my "twin" cousin H; my young cousin I; my beautiful cousin C. Family historians have deep roots and wide branches. When I look back in review, as happens with this prompt, I didn't know I had so many friends ~ Happy Dance ~ Now I'm less and less of a social extrovert, relishing solitude, so it takes determined effort and time to develop new friendships. There are friends who connect through mutual interests. There are those who bond on different creative, emotional, intellectual, or spiritual levels. We are all complex human beings and it's a rare friend who sustains and nourishes you on all levels of your being with reciprocal sharing and trust ― the special few on whom you can count at all times are extra precious. It may sound trite, but I can only say I am fortunate and blessed. Wherever my family and friends are, their regular presence is missed.